The first picture of tragic Reggie Young, the three-week-old Sunderland baby who died after being bitten by his family's pet terrier dog. 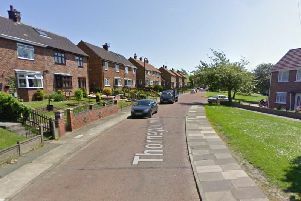 Police are today continuing to support the devastated family of a Sunderland baby who died after being bitten by their dog. Officers from Northumbria Police are still with family members and also in the community to reassure residents. Flowers outside a house in Falkland Road, Ford Estate, Sunderland, where a baby was mauled by a dog. The three-week-old boy, named locally as Reggie, was taken to hospital in the early hours today after being bitten by the small terrier at his home in Falkland Road, Ford Estate, but later died. His parents, Maria Blacklin, 29, and Ryan Young, 30, are believed to also have a son and daughter together, with Mr Young having a son from a previous relationship. Flowers have started to be placed at the scene by members of the stunned community. A 30-year-old man who was inside the property at the time of the incident has been arrested and is in police custody helping with inquiries. Clearly there are concerns around the care of the child at the time of this tragic incident. The family dog is currently in secure kennels and is likely to be destroyed. Police have emphasised that it poses no threat to the wider public. Superintendent Gillian Mitchell, leading the investigation, said: “Our thoughts are with the family of the baby at this difficult time. “We have officers supporting them and will continue to do so throughout our enquiries. “We recognise this incident is concerning for residents, and officers will remain in the area to offer residents reassurance and answer any questions they may have. “The family dog was quickly taken from the house and is now in secure kennels. Anyone who would like to speak with an officer can call police on 101, ext 69191.